I am still in shock at how authentic this came out. With Hannukah coming up next week, and with it being our first go at it gluten-free, I did some poking around the internet for recipes I could try. 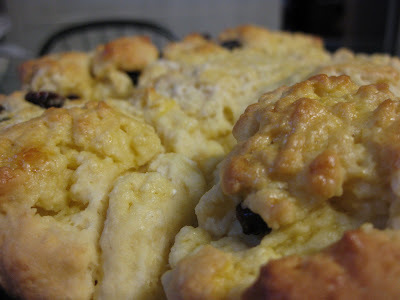 I came across this recipe by the blogger of Gluten-free Bay, and oh, my, was it good. I altered the recipe a little bit, so I'm going to post my slightly tweaked version of it here, but please visit Gluten-free Bay to see the original recipe here. Thank you, thank you, thank you for this recipe! 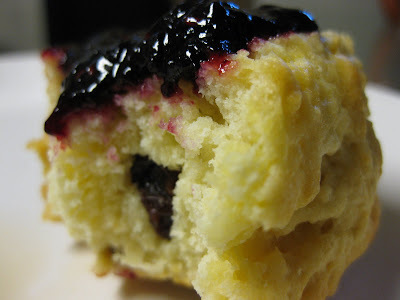 It has the same texture and slight sweetness as the challah I remember, and the same eggy fluff and taste. It is truly wonderful, and it is actually a piece of cake to put together (especially compared to regular challah, which one typically has to knead and braid). If you love and miss real challah, try this recipe. You won't be disappointed. It's especially delicious with some homemade black raspberry-mango jam slathered over a warm piece straight from the oven! Mix the yeast, warm water, and sugar and place in a slightly warmed oven, covered with foil, for 10 minutes until it has bubbled to the top. In a large bowl, combine potato starch, corn starch, brown rice flour, white rice flour, tapioca starch, salt, baking powder, dry potato flakes, and xanthan gum. Add the vegetable oil, honey, eggs, and yeast mixture and mix at high speed until it is all well-mixed. 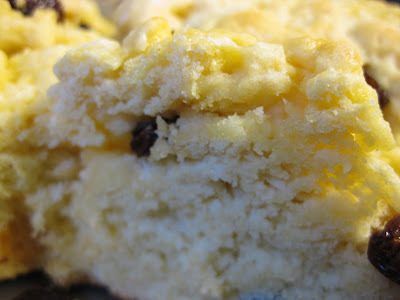 Add the raisins and blend in by hand until they are well-dispersed. Spray a 9-inch cake pan with baking spray. Grease your hands by spraying them well with baking spray as well, and then take large portions of the dough and shape them into large balls of dough (about 3-4 inches in diameter) - I had enough for about 6 - 7 balls - and arrange them in the pan with one in the middle. You don't need to press them together. Make the egg glaze by combining one egg yolk and 1 tbsp. water, and brush over the top of the dough. Spray a piece of plastic wrap and cover the pan, and put it into the still-warm oven to rise. Let rise until the dough is about an inch above the top of the pan, then remove from the oven and preheat it to 350 F. Brush another coat of egg glaze onto the dough and sprinkle with sesame seeds if desired. Bake for 20 minutes, then cover with foil and bake for another 25 minutes. If desired, remove the foil during the last 5 minutes of baking to let it brown a bit more. Cool in the pan on a wire rack for 5 - 10 minutes, then turn out onto the rack to continue to cool. Serve warm from the oven if possible (although I recommend waiting at least 10 minutes before slicing/consuming)! Freeze or refrigerate extra slices.